Arvindasava (Aravindasavam) is a classical ayurvedic medicine categorized under Arishta Category used as digestive tonic in infants and children. It improves appetite and increases physical and mental strength. It promotes optimum growth and development of the child. In ayurveda, it is also recommended in the treatment of all types of health conditions or diseases related to the children. Arvindasava (Aravindasavam) is prepared using following ingredients. The maximum of ingredients in Arvindasava provide nourishment and act on digestion. Aravindasavam improves strength, enhances growth and improves milestones in children. According to ayurveda, Arvindasava is a balanced preparation, which can be given as supplement in any type of disease in children regardless the dominance of the Dosha (humor). It mainly pacifies Vata and also works to balance Pitta and Kapha. Arvindasava increases the digestive fire and rectifies the digestive juices, which helps to prevent acid dyspepsia and promotes optimum digestion and absorption of nutrients. Overall actions of Arvindasava are observed on digestive system. A good digestion is required for a proper nourishment and growth of the child. Additionally, it also contains some ingredients like raisins, lotus flowers etc., which are highly nutritious. Arvindasava helps for improving growth and development in children. It improves cognitive functions and thinking skills. It enhances understanding, learning, remembering, problem-solving and reasoning skills. 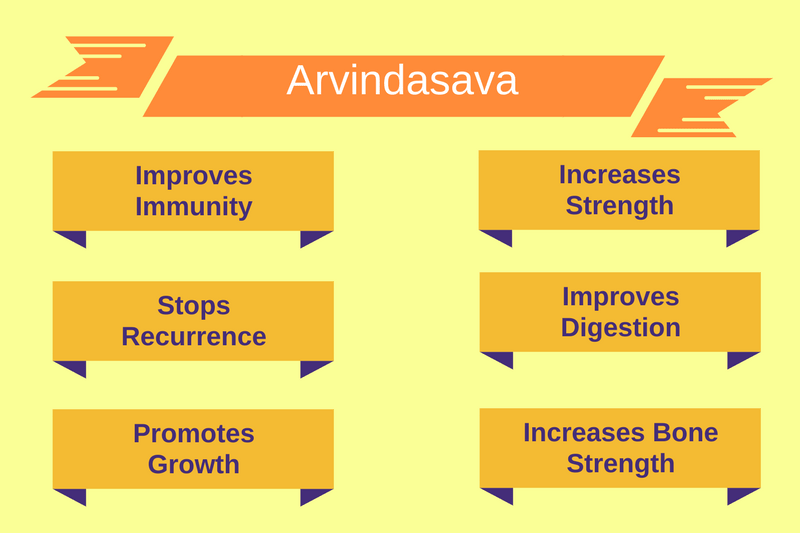 These benefits of Arvindasava are attributed to its ingredients like Vacha roots and Yashtimadhu. Vacha also helps to improve language milestones. In addition to cognition and language, it also helps to improve gross motor and fine motor milestones. It provides strength to the muscles and bones, which help to sit, stand, walk and run and keeping balance. These ingredients contain natural highly absorbable calcium, magnesium, zinc and other several essential minerals for the growth of the bones. This formulation is an ayurvedic mineral supplement and safe to use for 6 months even more if required depending on improvement in the bone strength. It is likely to be safe to use it for long-term. The general dosage of Arvindasava is as follows. How long can we use Arvindasava in kids? Arvindasava can be given for long term and for years without any issue. Arvindasava is considerably safe for most infants, children and adults in recommended dosage of Arvindasava when taken under professional supervision. There is no side effect reported with Arvindasava. Can aravindasavam be given along with honey? Classically, it is recommended to mix in equal amount of water. If child is not taking it due to its taste, you can add honey in it while preparing a dose. What should be the right dosage of arvindasava for 5 years old girl? 7.5 ml twice a day should be the right dosage for 5 years old child. What is the dosage for 14 months baby boy? Only 7.9 kg Weight I am seriously concerned about his growth height also short 72 cm only pls reply soon. The dosage should be 3 ml and it can be given 2 times a day.